And yes! The best sushi you can find is in Japan! I haven’t been every places in this world, but so far it seems that’s the fact. 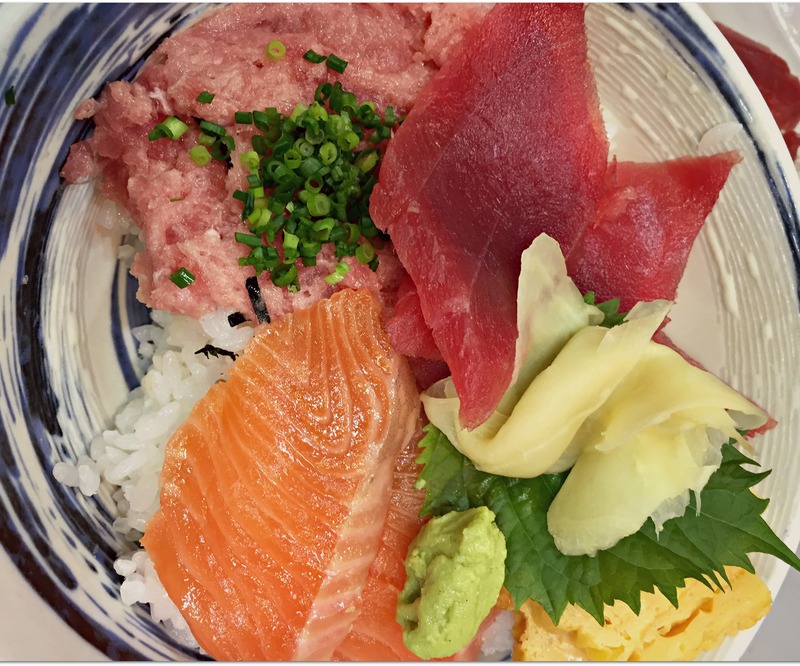 Maybe you remember that I wrote about the Tsukiji Fish Market. Unimaginable amount of fish waits every day to be picked up, therefore the quality and freshness is excellent. There are lot of places where you pay the price, BUT it’s easy to find cheap but amazing sushi in the city. 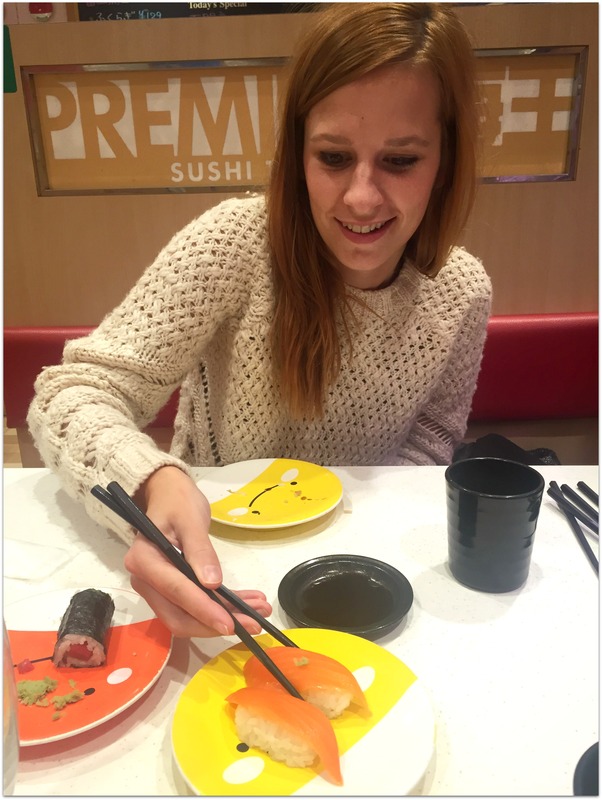 In case you are a sushi train fan, I suggest to try one of Ganso sushi places, aka Sushi Go-Round. There you don’t order via iPad, but they welcome you with really good quality fish, kindness and free green tea. Latter one you can find at your table, you should use around 1 teaspoon tea powder, pour some hot water in the cup and mix them together. Those who are looking for Michelin star winner restaurants, Tokyo has crazy amount of them. Only thing you need to keep it mind, book a table far in advance, sometimes months before your arrival, to make sure you get in. It’s not rare that a dinner costs 200-300 USD per person, we didn’t want to spend that money, but it might be a lifetime experience for those who did it. 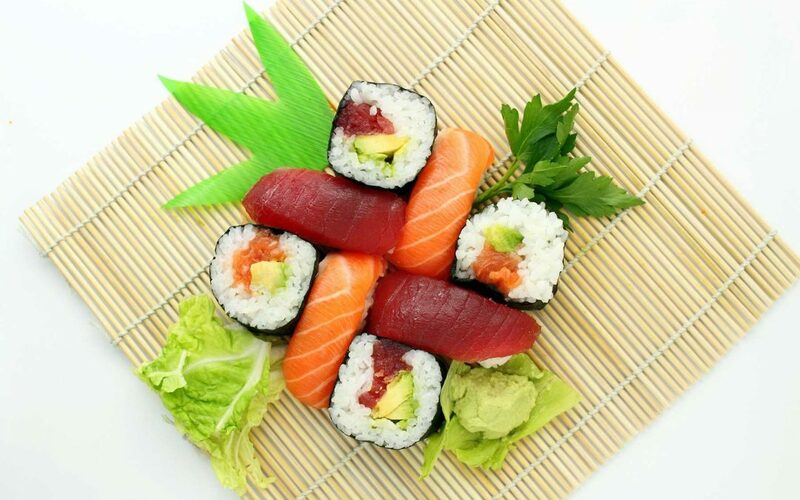 +Tip: many sushi restaurants have lunch special, you can spend sometimes 1/4 of the dinner price, if you’re a bit flexible and go around noon. We’ve been in Katsura Sushi restaurant, where the 15 sets of sushi with miso soup and green tea costs 1050 JPY, which is around 8 USD, it’s unbeatable price, and the sushi was amazing. We were seated at the counter and could watch every move of the chef. He placed the pieces on our banana leaves as soon he made them. We enjoyed it? Oh, yes! I suggest this place to everyone! The best to be there at the opening time, which is 11:30 to make sure you get some free spots. The restaurant is pretty popular by workers around this area, and can be busy during lunchtime (yes, it’s experience). One of my all-time favorite. 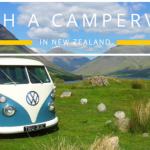 We tried some places and each of them was individually different. My ultimate favorite was Afuri. It’s also a chain with some places around the city, and has a specialty. The broth made from pork and chicken, plus it’s more citrus taste, and clean. You can choose from different soup base: shoe (soy sauce based), shio (salty base), yuzu-shio (my love, salty and citrus base) and much more. If you feel like something different, get the Tsukenmen, the ramen noodles and sauce are separated in different bowl, you need to dip your noodles into the sauce and then slurp it all (you gonna know what I’m talking about when you hear the slurping in Japan). 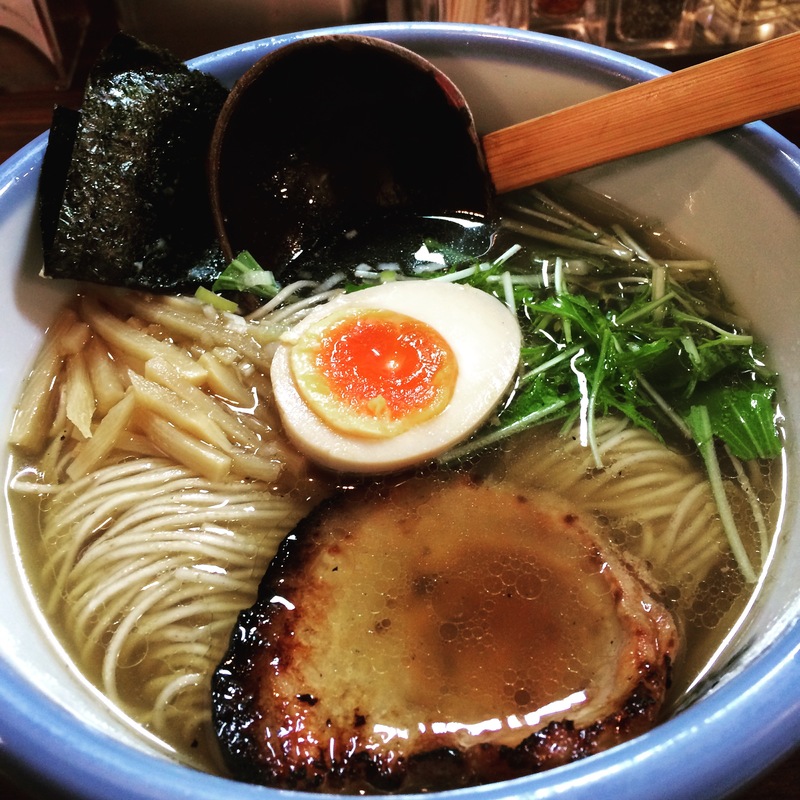 There are ramen places in every corner, how to choose a good one? Follow the local people, if a place is busy, or even there is a waiting line in front of it (which is not rare), it’s a good hit! 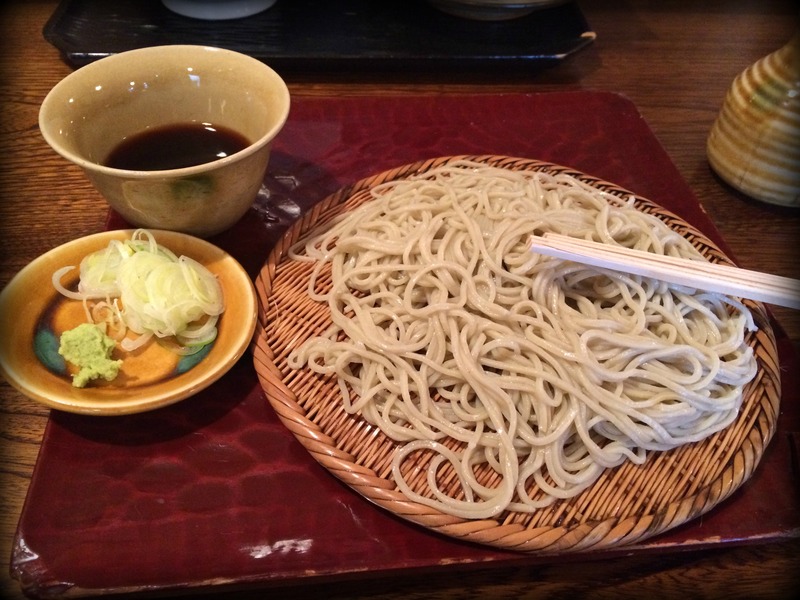 Half of the time we spent in Japan, I was experimenting with some food containing gluten, like ramen, but in ideal case soba is made with 100% buckwheat flour, so it can be gluten free. The chefs are learning for years to make the soba noodles perfect. You can eat it cold or hot, with soup of with a dipping sauce. Here we were in a restaurant with tatami area, where you need to take off your shoes, what a super experience! You pay for cook it yourself, of course that’s not just all about, more than that. So, what is shabby-shabu? You receive an interesting big pot divided usually for two parts, so you can make immediately two kind of soups. You choose the base of your soup, (in case you’re gluten free, ask for only salty water without soy sauce) the meat you want to use, if you are not vegetarian. Sometimes they put all the ingredients on your table, but in our case we had a long table filled with fresh, awesome vegetables, noodles, spices, tofu, etc. 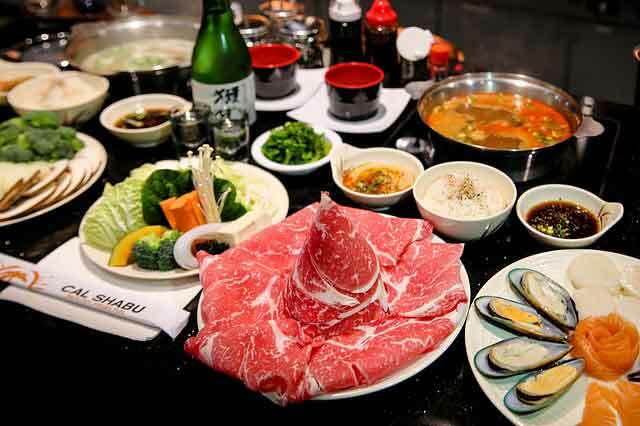 The shabu-shabu generally works like an all you can eat for a limited time. You can pay for 60, 90 or 120 minutes, and you can play the chef part :). Have fun! I am the one who was raised with schnitzel at home, so I love everything that is battered. It’s another thing, that my stomach is not a big fan of them. (No worries, in the meantime I stopped my experiments and following gluten free, diary free diet again). 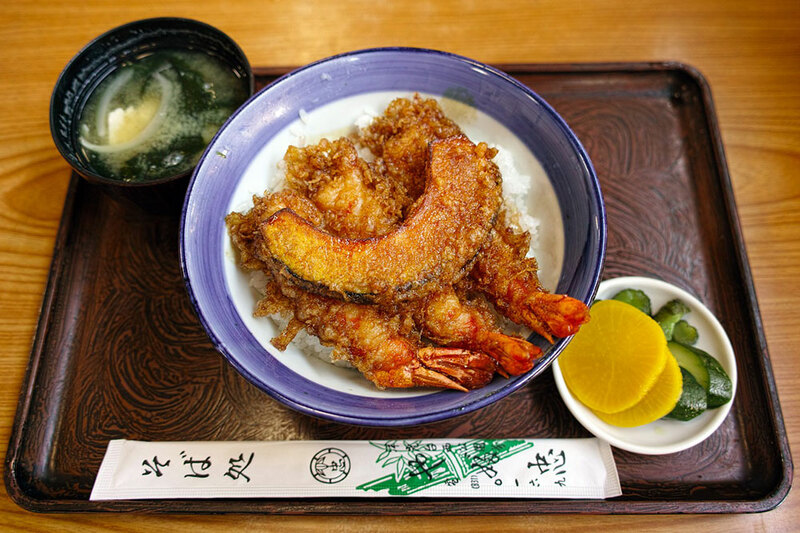 The tempura can be battered fish, seafood, vegetables, and basically everything. 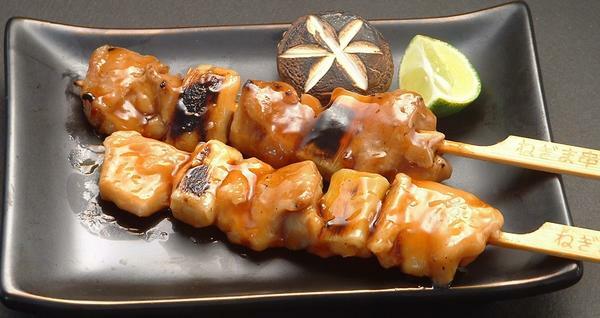 Chicken skewers, with or without sauce. Should you try them? Absolutely! 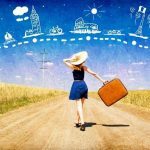 Is it okay to get from the street? Another yes, it’s a perfect street food. 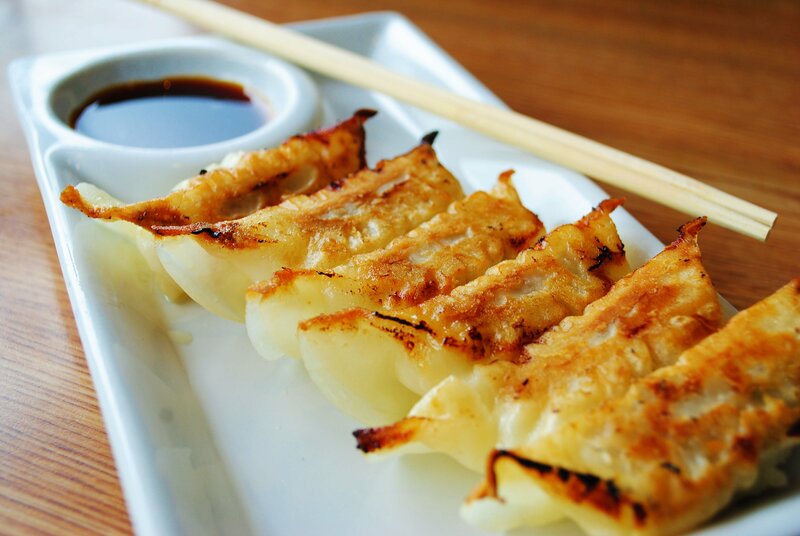 Oh, those dumplings! You gonna always want them. They are filled with pork and veggies usually, and have amazing taste. Don’t forget to try the sauce on the side! 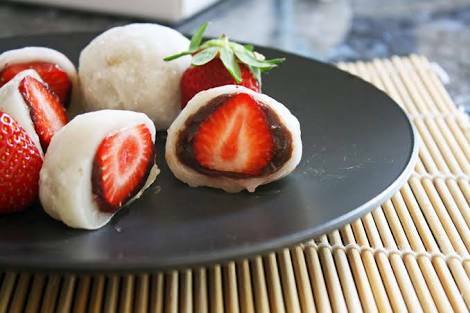 The mochi made with rice flour, and this version is filled with azuki bean paste, and the strawberry is just the cherry on the top. It might sound strange but you should give a try, it’s a hidden gem. Here everything contains green tea, Kit Kat, ice-cream, chocolate, mochi, and if it doesn’t exist, I’m sure they gonna invent it in the future. 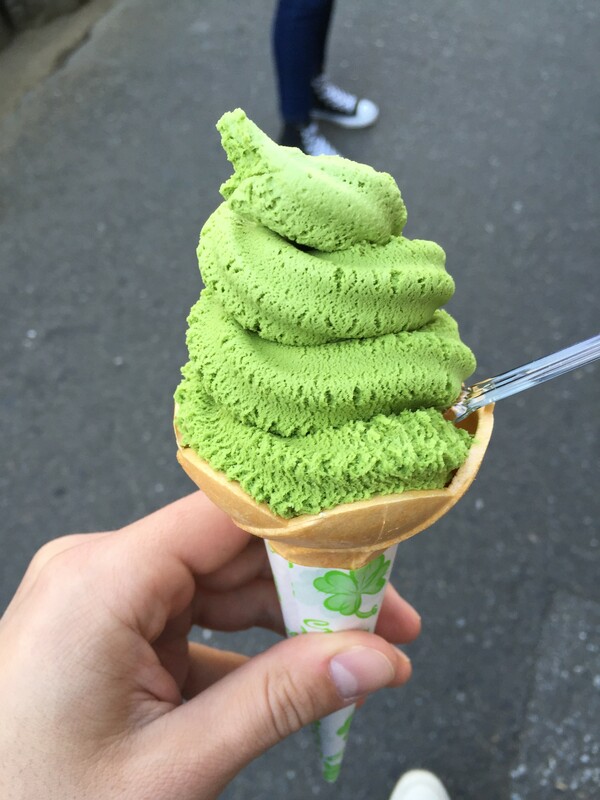 This green tea ice cream is from a tiny store in Asakusa next to Sensoji Temple, you can find other cool desserts there, like the green tea mochi. 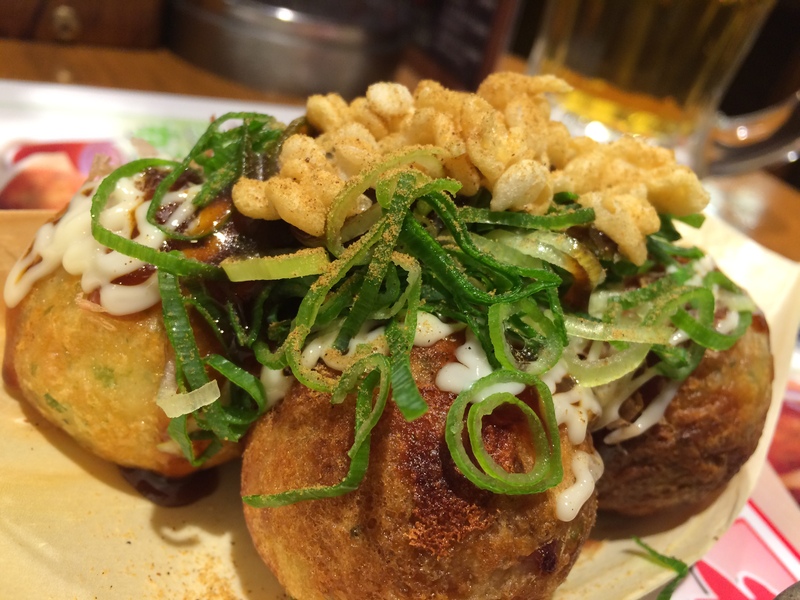 Lets’s start with the look, it seems good, and the smell, also good, but I’m not a big fan of octopus, which is one of the main ingredient of this balls. Give a try, lot of people love it! If you’re not hungry for now, then something is wrong. 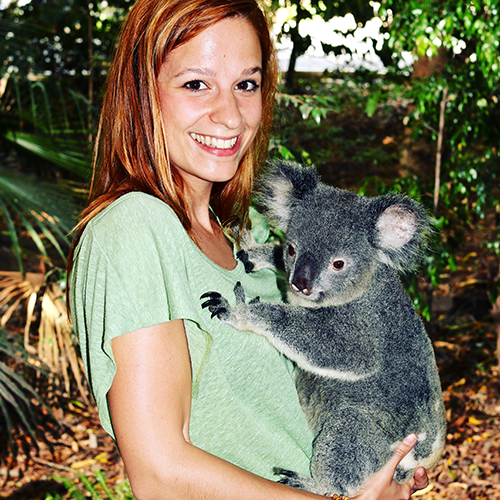 You would like to go to Japan, right? Tokyo Neighbourhood Guide – Part 1. Tokyo Neighbourhood Guide – Part 2. In case you have question, feel free to leave me a comment! Yum! Everything looks tasty! Thank you for the recommendations! This is going to make choosing where to eat in Tokyo a lot easier, the sheer size of Tokyo is a little overwhelming. Thanks Therie! Let me know what was your favorite!